The map shows all the flights I’ve been on since my very first one from Amsterdam to London in July of 2001. The counter currently stands at 85 individual flights, good for a total distance of 174,000 km or 108,000 miles. That’s equivalent to more than four trips around the Earth or about half the distance to the moon. Standing out on the full-world view are a trio of roundtrips to the US, an observing trip to the VLT in Chile, a holiday in South Africa and Mauritius, and a conference plus holiday in Hong Kong and China. 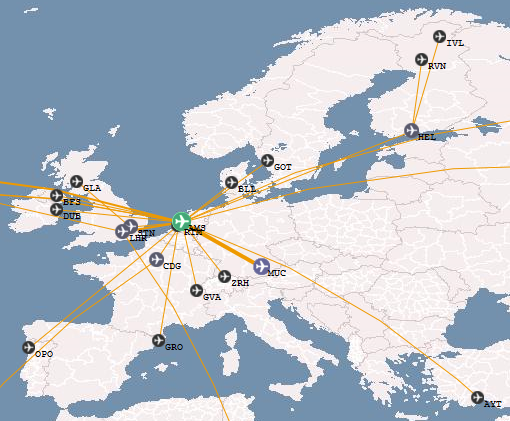 Zooming in on Europe, it’s evident that a lot of my flights were short-haul. The eight roundtrips to Munich (working visits to the MPE in Garching) show up particularly strongly. For a scrollable and zoomable version, with access to various statistics, click either of the above maps.